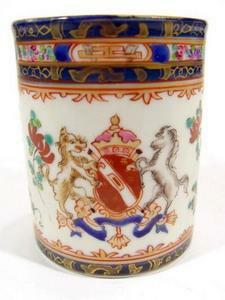 ARMORIAL PORCELAIN refers to any porcelain decorated with Crests or Heraldic motifs. Most Armorial Porcelain items are in the form of a Display Plate or larger porcelain Chargers and also as general chinaware & tableware. Most armorial porcelain decoration includes the depiction of animals or birds, often mythical or enhanced with extra powers and in extraordinary poses, and also heavy symbolism that denotes power or elevated social status. Noble or wealthy families in late Medieval Europe had chinaware and other items made to bear their Family Crest, also referred to as a Coat of Arms. Originally most Armorial dinnerware were made of earthenware, but as porcelain became more prevalent and accessible in Europe, this type of individual or custom decoration became more popular. Most such Armorial Porcelain decoration is applied using Transfer-ware techniques (decal) and very rarely completely by hand. Chinese Armorial Porcelain was imported to Europe as early as the 16thC and much later to America. Imports increased substantially around mid 18thC onwards, until Chinese export porcelain was slowly replaced with service and dinnerware sets made wholly in Europe, particularly from Germany, United Kingdom, and France. Some Italian Armorial Porcelain also made its appearance but to a lesser extent. The vast majority of Armorial Porcelain plates or larger items with ample display surface had a customized Coat of Arms or Family Crest only on one side and near the rim, in prominent colors, but proportionally sized. A few, and the most desired of all for serious collectors of Armorial Porcelain are the plates or items that have extensive and oversized decoration, often with relief work or special decorative features, that span the majority of any available visible surface. Some Armorial Crests include only a distinct monogram and some gilded simple scrolling or border decoration, but the most significant ones had a full ensemble of extensive symbolism and intricate boastful fantasy designs. There are several resources on the web to decipher these symbols and many of them are quite universal; however, it is the specific combination of these symbols on Armorial Porcelain that makes them unique and also attributable to a specific family or official organization of a certain period or locale. When appraising Armorial Porcelain it is important to consider any specific provenance that may be known and/or documented. If available, the history of an item's ownership can help in fetching good prices at auction and your Armorial or Crested porcelain would be appraised the highest. See below for some examples from our Antiques Price Guides.. Furthermore, if your Armorial Porcelain was made by a reputable porcelain company such as Meissen, Sevres, Coalport, Chelsea, Lille and others, and it is authentic, then it is even more valuable and desired by collectors. Makers marks on Armorial Porcelain or to authenticate porcelain marks in general, can be found in our Porcelain & Pottery Marks Guides. Nowadays, the monogramming of plates and general tableware is a remnant of this practice, but it is done in a less prominent manner and with almost no additional design features or drawings of mythical creatures and power symbols. It is found less and less on Porcelain and now mostly on monogrammed Silverware or Cutlery.